Part of the “deal” with the grant that funded the creation of the flagbooks was that the finished product would be available to show in other spaces. The first such showing since it’s unveiling at the 3rd on 3rd Gallery last March will be at the Cattaraugus County Arts Council office on Main Street in Allegany, NY. 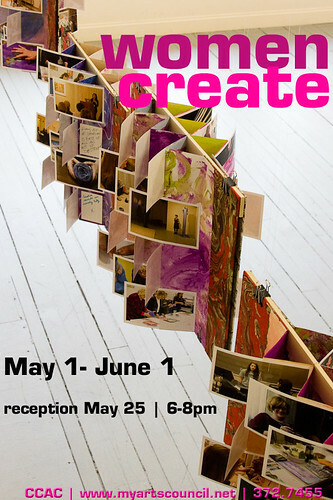 Please stop by to see the books, and plan to join us for a reception from 6-8pm on May 25, 2012. Click poster for more information! The closing reception was wonderful, though I wish all of the artists had been able to attend. Wouldn’t it have been cool to get a great big group picture? I’ll put that on the list of suggestions for next time. A special luncheon event has been added to Jamestown’s SWAN (Support Women Artists Now) Day celebration this Saturday, March 31. At 1 pm in the Reg Studio Theater at 112 East Third Street, Christina Marsh Christina will walk participants through a visual study of the availability of food in Jamestown. Shown here is a comparison of milk offered at various stores throughout the city. Jamestown, NY – Deciding that food and art are an irresistible combination, the organizers of this Saturday’s (March 31) Support Women Artists Now (SWAN) Day celebration have added a visual presentation of the availability of food in Jamestown. With a background in food preparation and management, Marsh has a passion for using food that is locally produced. After taking photographs of places where people can get food in this area, she analyzed them, looking particularly at location and access. Marsh’s interest has led to her participation in the University at Buffalo Food Policy Summit, World on Your Plate Food Conference in Buffalo, and an internship with Chautauqua County Rural Ministries’ Friendly Kitchen. A member of the Food Security Task Force Committee, a project of Chautauqua County Creating Healthy Places to Live, Work, and Play, she is currently interning with the Chautauqua County Health Department, working on the Farm to School project. Marsh has studied food from the social work, sociology, and anthropological disciplines. While living on her husband’s family’s farm, Marsh stayed at home to raise four boys. She will graduate in May from the State University of New York at Fredonia with her bachelors in social work and interdisciplinary minors in public health and sociology. In the fall she will pursue her Masters of Social Work from the University at Buffalo. Another SWAN Day event is the Art Market from 10 am to 3 pm at Infinity Visual and Performing Arts at 115 East Third Street. Walk-ins are welcome to the SWAN Day hands-on workshops led by accomplished artists and held at Infinity Visual and Performing Arts and the Arts Council for Chautauqua County. Afternoon workshops run from 2-5pm and are Introduction to Japanese Traditional Painting, and Image Transfer. Details are on-line at https://womencreate.wordpress.com/swan-day-2012/workshops/. The closing reception for the Women Create art exhibit at the 3rd on 3rd Gallery at 116 East Third Street in downtown Jamestown will be 7:30-9 pm on Saturday. The reception will include the unveiling of the Photo Flag Book Installation Project with the theme of images of women making their artwork. Three workshops were held to create this project, with funding provided in part by a Ray and Wyn Ritchie Evans Foundation Artists in the Community Grant administered by the Cattaraugus County Arts Council. Free and open to the public, Women Create is presented in cooperation with the Arts Council for Chautauqua County. Regular hours are 10 am-4 pm, Monday-Friday. For viewing by appointment, contact Len Barry at (716) 664-2465, ext. 227. For details on all these SWAN Day activities, visit https://womencreate.wordpress.com/.